Kauai, the oldest of the Hawaiian islands was the first tropical destination we’ve visited. Several years after that 10 wonderful days we’ve spent there (post updated in 2018), we still think that Kauai is one of the most amazing pieces of the world, dominated by lush green and turquoise colors. Being such a famous dream destination for travelers, it came as a refreshing surprise to us how undeveloped Kauai actually is. Apart from a very few resorts and some large shopping malls (yes, there is a Walmart in Kauai; don’t forget, it’s still the USA, even though it’s far out in the Pacific Ocean 😀 ), it’s quite a peaceful island. We were closely connected to nature wherever we went, and it’s not at all that crowded tourist paradise we imagined it to be. It’s simply just a paradise. 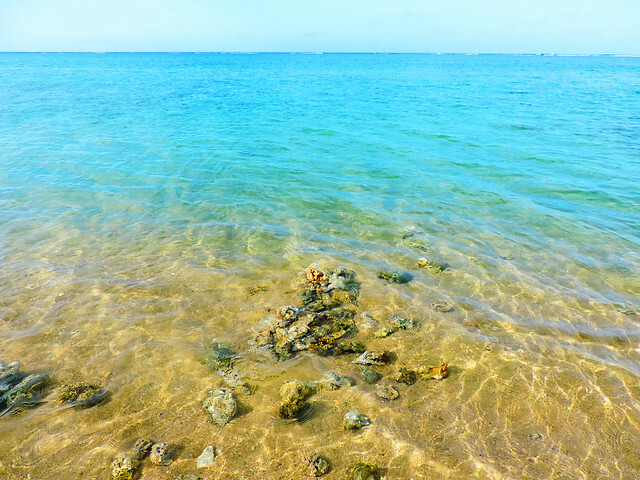 The long beach is protected by a coral reef that’s very close to the shore – especially at the east part of the beach -, and offers probably the best snorkeling opportunities on Kauai. We enjoyed swimming with sea turtles and colorful tropical fish, or lying on the beach with Hawaiian monk seals. It was fun to explore the caves and tunnels both on land (behind the beach parking area) and in water. We were surprised how few people were on the beach. Maybe because it’s more remote and can be hard to access in the rainy season, but it didn’t seem to be nearly as popular as Poipu Beach or Hanalei Bay. Well, we didn’t mind the lack of crowds. 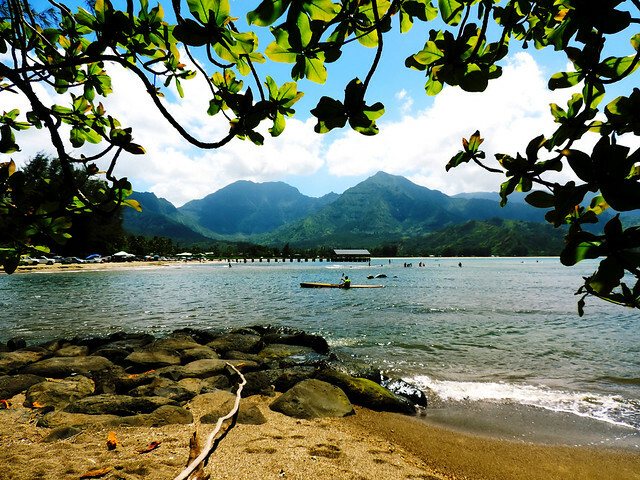 Hanalei Bay is not only our favorite. 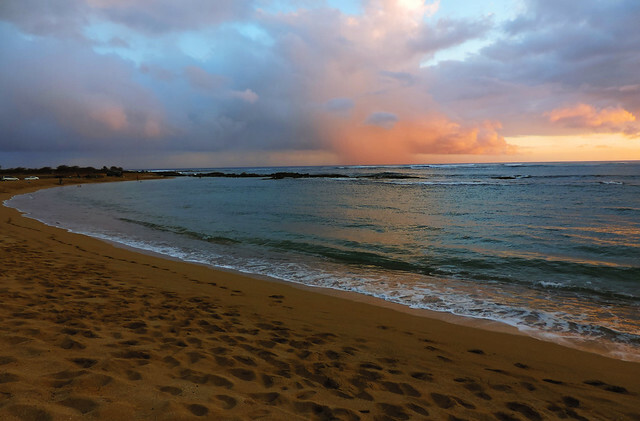 It’s often mentioned as the best beach of Kauai in travel guides – and for a good reason. It looks exactly how you imagine a tropical beach while daydreaming about eternal summer in the middle of a freezing winter: sandy shore, turquoise bay, palm trees bending in the wind, and a small pier to take a romantic walk while enjoying sunset colors. Now add some pretty views of lush green mountains and roaring waterfalls in the background, and you get Hanalei Bay. Swimming is usually very safe here, it’s not for snorkeling though, because there’s not much to see under the water in this sandy bay. 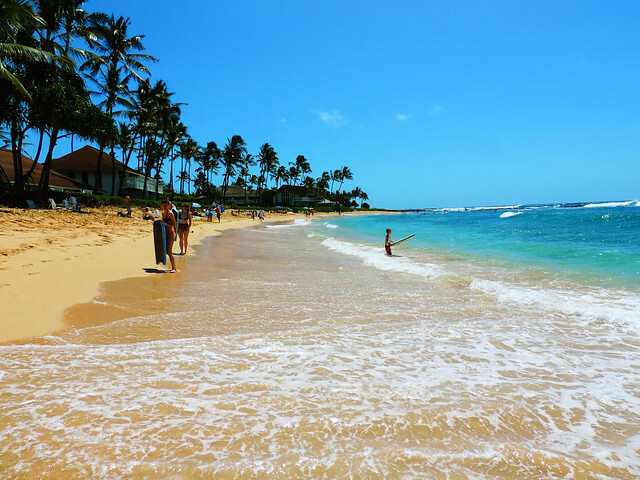 Poipu Beach lies on the sunniest south shore. 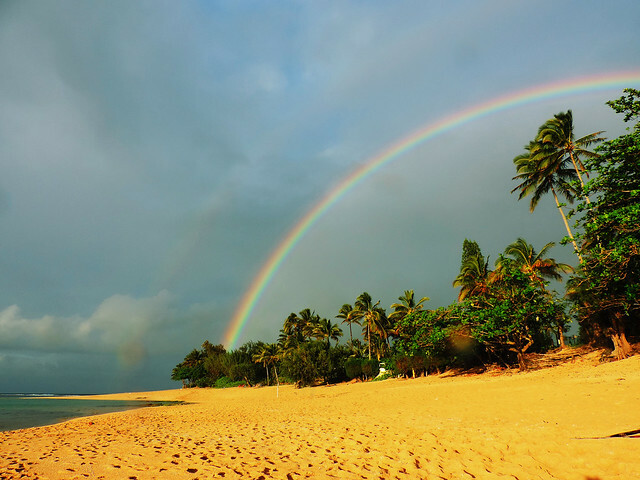 It’s the most developed beach on Kauai and it’s often highlighted in tour guides. That makes it the most popular and also the most crowded beach. Poipu is full of palm trees and full of life! Surrounded by fancy resorts, there are elegant restaurants and cocktail bars on the beach. But you find picnic benches, too, if that’s what you prefer. Its two beautiful bays have moderate waves as they are protected by a reef – yes, a perfect snorkeling spot! 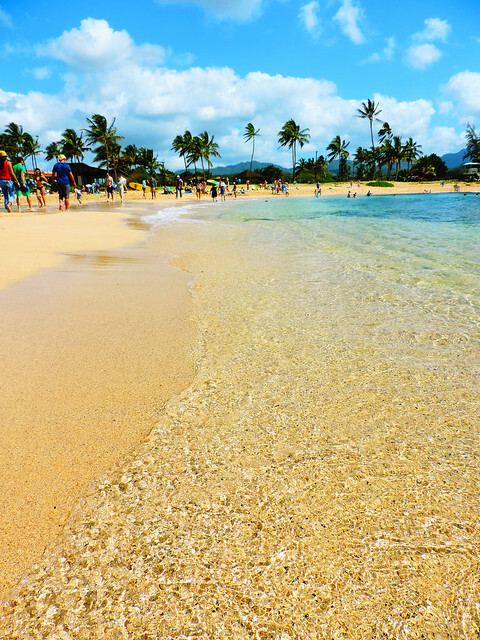 I can’t talk about Poipu without mentioning Kiahuna Beach which is the bay right next to it. It’s very similar to Poipu, except the waves that can be much bigger at Kiahuna Beach. We noticed that the beach is divided for surfers and swimmers. 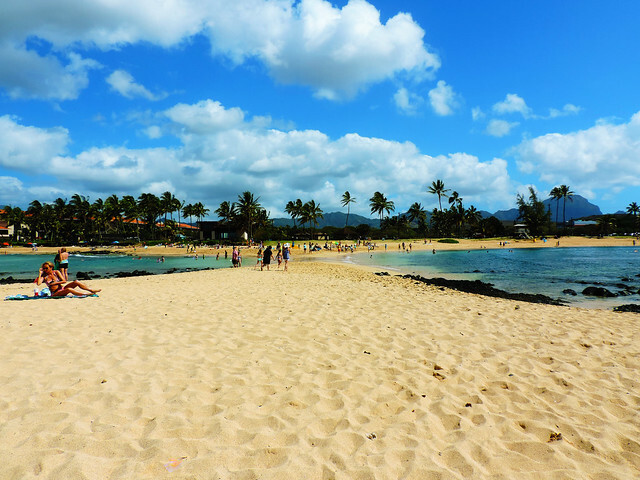 Poipu’s calmer water and snorkeling spots, and Kiahuna’s adventurous waves were a perfect beach day mix for us. 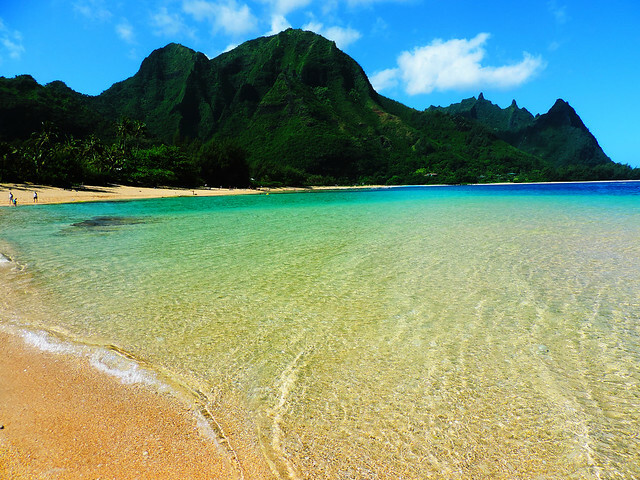 This perfectly sandy north shore beach has the most calm, shallow water on Kauai. Big trees give shade on the shore, their branches are even above the magically blue water at some spots. 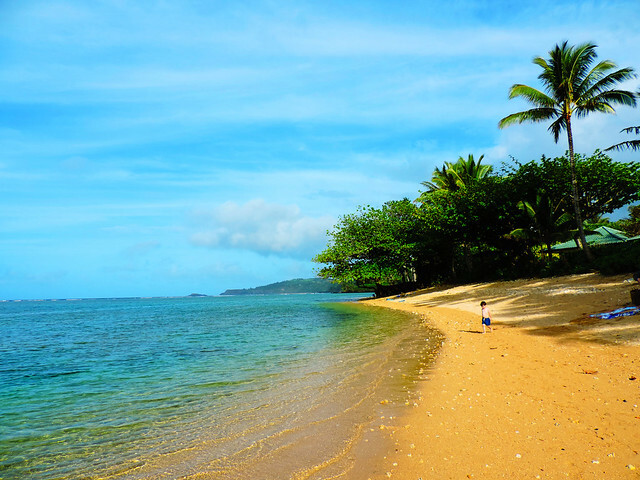 We have so good memories of Anini Beach! This was the place where we’ve seen humpback whales jumping in and out of the water while we watched the sunset. It was such a pretty beach to refresh ourselves after our breathtaking and exhausting 8 hours long hike along Na Pali Coast! This south shore beach has a deep, clear, protected bay for swimming and two smaller ponds for children. Salt Pond Beach is probably the only one on Kauai where you are allowed to camp on the beach. Lihue and Wailua are also located in this central area, but Hanalei and Princeville on the north shore are also lovely places to stay. 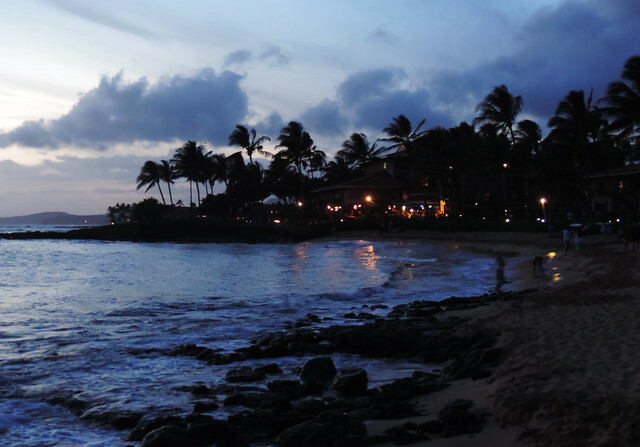 Koloa is close to Poipu Beach, and Kekaha and Waimea are also on the south shore. While enjoying the beauties in Hawaii, you should never forget about being careful and respect nature whatever you do – and that applies to swimming and snorkeling, too. I mentioned beaches which are usually safe to swim, however you always need to check the current conditions and the typical water and wind conditions of the season of your visit. Other than that… just dive into the beauties of these magical beaches! Have you ever been to Hawaii? What is your favorite beach? This post was updated in December 2018. Hey guys, I was interested in knowing in which month you visited Kauai! I’m loving all these posts but this one (and the sunset post) interest me most because you mentioned you heard whales at Anini Beach. I’m going the last week of May and wanted to try to find out if I have the chance to hear the whales for myself. Thanks and keep up these amazing posts! Your photography is stunning and making me wish I was there already! As a resident of Kauai, Anini is my favorite beach. Humpback whales visit Kauai between November and March and can be seen from almost anywhere, especially the North and East shores. They are great fun to watch. Whale watching cruises are available durning the winter season.They summer off Alaska. Kati, you live in a paradise! 🙂 Thanks for reading and adding your thoughts. Whale watching is so much fun! Just a small correction. 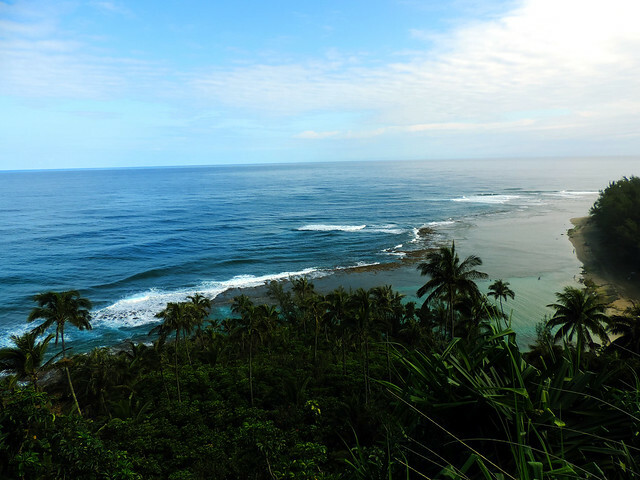 You can snorkel and camp at Anini Beach. The last time I snorkeled there I swam with a 3 1/2 foot sea turtle. Magical! You won’t see the Humpback whales in May. They’re present from December to the end of March, when they head north. They don’t eat while they’re in Hawaii. They’re there to give birth and as soon as the babies are big enough to they head north to Alaska where there’s plenty of food. Anini Beach has a great camping area. Great beach for less experienced swimmers. Great for snorkeling. A great write-up and some lovely photos! Glad you hiked the Na Pali Coast 🙂 Aloha. Mahalo, Jonathan. 🙂 Hiking in Kauai was just as incredible as enjoying its beaches if not more! We are going back in July with out kids and wanted to see the Sea turtles. Where is the best beach to see these magical creatures and are they there year round or is there a certain time of the year they are there? That’s great, Kauai is a paradise, you’re going to have a fabulous time! We’ve seen sea turtles several times on different beaches – on Tunnels Beach, Anini Beach and Poipu Beach. 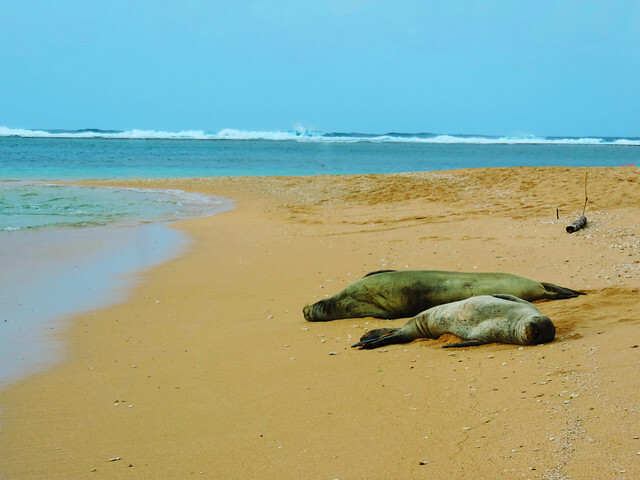 We don’t know about any certain time of the year and as we know you can see them on any of the beaches in Kauai. You need some luck, too. 🙂 Our favorite snorkeling spot was Tunnels Beach as the water there is shallow and the coral reef is very close. We’ve seen turtles and monk seals several times there. Not only when snorkeling they came to the shore, too. Good luck and have fun! My husband and I were just there and in Poi’po my husband swam with 6 sea turtles.. they seen to like the rocks aking the shore line. We also saw about 40 humpback whales while on a boat tour of the Napali Coast.. truley an a magical paradise. 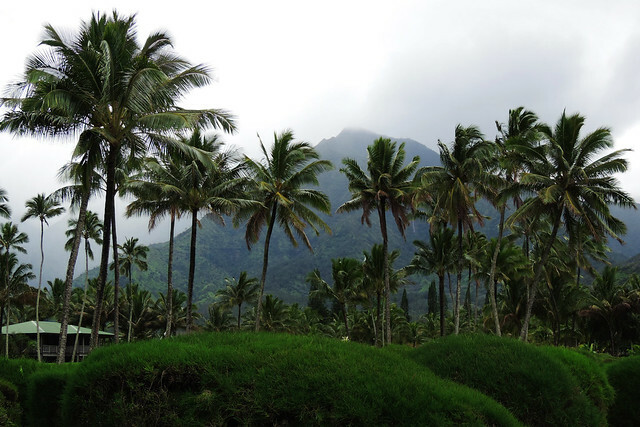 Our favorite boat tour is to go from Hanalei in the summer along the NaPali. They use the rigid inflatables that are smaller and can go in and out of the sea caves and under waterfalls. No whales in the summer though! Oh those waterfalls sound tempting enough! Just returned from first trip to Kauai. Went to all these beaches – weather and surf conditions are important as noted – but surprised not to see Hideaway’s Beach listed. It was my favorite. Intimate, Billygoat access (but with ropes to help you up the cliff) – great snorkeling, fully protected by reef, beach access to water and you can swim from there to Queen’s Bath. Reasons is simple, haha, we haven’t heard about that one. 🙂 Thanks for sharing about it! Thanks for your recommendation on Kauai and the beaches. We will be traveling in this region and are very keen snorkelers, so we will follow some of the adventures you have outlined.